But not if you sabotage your case! Before you go to court, before you go to the DMV, before you even talk to a lawyer about your case… Read this FREE book! The tips in this book will prevent you from sabotaging your case, and will improve your chances of getting your license back and avoiding a DUI conviction. Being arrested for DUI is one of the most stressful events that you’ll ever face. A DUI conviction can ruin your career, your relationships, and your finances. At this point, you need someone in your corner to give you unbiased advice and help guide you through this ordeal. That’s exactly why I wrote this book. This “No B.S. Guide” is exactly what it promises to be — unbiased, straight-to-the-point, “No B.S.” advice that will help you avoid sabotaging your case. It’s a quick read, and gives you valuable tips that may make the difference between winning or losing your DUI. To get your FREE copy, just type your name and email address in the box below and I’ll instantly send you a digital copy of the book. Want to avoid the stupid mistakes (like hiring a “dump truck” lawyer) that will sabotage your chances of avoiding a DUI conviction? Put yourself in the best position to win by reading this FREE consumer guide and learning THE TRUTH about how DUI cases can be won. By this point, I’m sure that you’ve received a ton of letters from other lawyers, and have probably already sat down in front of your computer, nervously searching for answers about what to do next, hoping to find some unbiased advice to help guide you through this mess. This book will help you figure out where to go from here. Throughout the book, you’ll learn THE TRUTH about what you can do after being arrested for DUI to help improve your chances of getting your license back and winning your DUI case. You’ll learn the 15 action steps that you can take immediately to improve your chances of winning, tips for hiring the right lawyer, and you’ll even learn about some of the basic defenses that may be available in your case. A few of the most common defenses in DUI cases, and THE TRUTH about how an unprepared or undedicated lawyer can cripple your case by overlooking these obvious defenses…. This book is packed with information that will help you understand what to do next, and I’d like to send you a complimentary copy to help you survive your DUI arrest. A DUI conviction has the potential to ruin your career, your family, your life, and your freedom. You’re facing a serious case, and the clock is ticking. The first important deadline in your case is just 10 days after your arrest, so you need to take action immediately. Get started by requesting your complimentary copy of The No B.S. 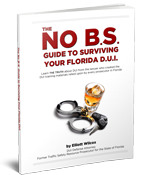 Guide to Surviving Your Florida DUI right now. To get your copy delivered instantly, just type your name and email address in the form at the top of the page. You will instantly receive a copy of The No B.S. 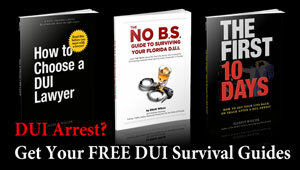 Guide to Surviving Your Florida DUI, delivered straight to your inbox. Nope, you’ll only receive two emails: 1) the book, and 2) a text-only follow-up email tomorrow to make sure the book didn’t get caught in your spam filter. By giving you as much help and unbiased advice as possible before we meet, I’m hoping that you’ll see how serious I am about helping you win your DUI case, and will call me about your case. After reading the book, if you decide that you’d like me to represent you, call my office at (813) 699-5517 to schedule your initial appointment, and we’ll get to work preserving critical evidence, getting you a temporary permit so you can continue driving to work, and doing everything that we can to successfully defend your DUI case.